Let us go with confidence to the throne of grace, that we may obtain mercy and find aid in seasonal aid. Ps. 44, 2. My heart hath uttered a good word: I speak my works to the King. V. Glory. 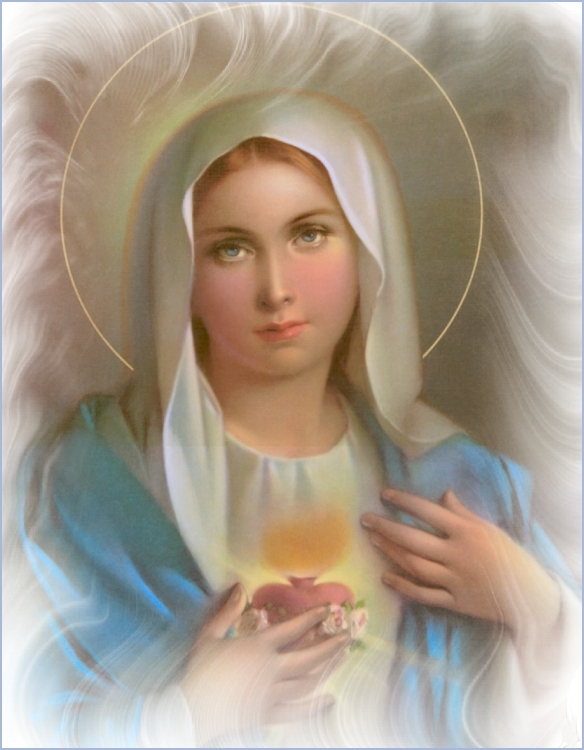 ALMIGHTY, everlasting God, Who didst prepare in the Heart of the Virgin Mary a worthy dwelling-place for the Holy Ghost; mercifully grant that we, devoutly contemplating the festivity of the same Immaculate Heart, may be enabled to live according to Thy heart. Through our Lord . . . in union with the same . . . In Low Masses only, there is made a commemoration of St. Timothy and Companions, as this day is their Feast also. BE APPEASED, O Lord, and bestow Thine assistance upon us, we beseech Thee, and by the intercession of Thy blessed Martyrs, Timothy, Hippolytus, and Symphorian, stretch forth upon us the right hand of Thy forgiveness. Through our Lord. Lesson, As the vine I have brought forth, from the Mass for the Feast of the Maternity of the B.M.V.. Ecclus. 24, 23-31. My heart shall rejoice in thy salvation: I will sing to the Lord, Who giveth me good things: yea I will sing to the name of the Lord the most high. V. Ps, 44, 18. They shall remember thy name throughout all generations. Therefore shall people praise thee for ever: yea, for ever and ever. Alleluia, alleluia. V. Luke 1, 46, 47. My soul doth magnify the Lord. And my spirit hath rejoiced in God my Saviour. ATTHAT time, there stood by the cross of Jesus, His mother, and His mother's sister Mary of Cleophas, and Mary Magdalen. When Jesus therefore had seen His mother and the disciple standing, whom He loved, He saith to His mother, Woman, behold thy son. After that He saith to the disciple, Behold, thy mother, And from that hour the disciple took her to his own. OFFERING THE Immaculate Lamb to Thy Majesty, O Lord, we beg that the Divine fire which ineffably inflamed the Heart of the Blessed Virgin Mary may be lighted in our hearts. Through the same Lord . . .
Commemeoration of Sts. Timothy and Companions. MAY the offering of Thy consecrated people be acceptable to Thee, O Lord, for the honor of Thy Saints, by whose merits it knoweth that it hath received help from tribulation. Through our Lord. REFRESHED by Divine gifts we humbly beseech Thee, O Lord, that, by the intercession of the Blessed Virgin Mary, the solemnity of whose Immaculate Heart we have just venerated, we may be freed from present dangers and may attain to the joys of eternal life, Through the Lord . . . FILLED with the abundance of the Divine offering, we beseech Thee, O Lord, our God, that, by the intercession of Thy holy Martyrs, Timothy, Hippolytus, and Symphorian, we may ever live by the partaking of the same. Through our Lord.